Provide comfort for the family of Lorine Hewson with a meaningful gesture of sympathy. 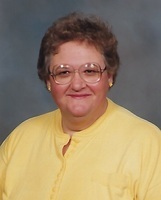 Lorine Hewson, 74, died Thursday, April 11, 2019 at the High Plains Retirement Village in Lakin, Kansas. She was born September 20, 1944 in Great Bend, Kansas the daughter of Harry Paul & Gertrude Marie (Selders) Hewson. Lorine grew up in Garden City. She attended Holcomb schools and graduated from Holcomb High School. She then graduated from Garden City Community College and McPherson College where she earned her Bachelor’s Degree in Education. Lorine worked as a teacher for the Larned school district and the Holcomb school district. In 1979, she became the house manager for the Emmaus House in Garden City where she worked until her retirement in 2017. Lorine was a member of the Pierceville Federated Church and she enjoyed sewing, cooking, and collecting John Wayne Memorabilia. Survivors include a brother Paul & wife Jane Hewson of Garden City; two nieces; and one nephew. Lorine is preceded in death by her parents and a sister Linda Hewson. Funeral services will be held at 10:00 a.m. on Tuesday, April 16, 2019 at the Church of the Brethren in Garden City with Von Hunn officiating. Graveside service will be held at 2:30 p.m. on Tuesday, April 16 at the Larned Cemetery in Larned, Kansas. Friends may call from Noon to 8:00 p.m. on Sunday at Garnand Funeral Home in Garden City. The family suggests memorials given to the Emmaus House in care of the funeral home. To plant a memorial tree in honor of Lorine Hewson, please visit our Heartfelt Sympathies Store. We encourage you to share your most beloved memories of Lorine here, so that the family and other loved ones can always see it. You can upload cherished photographs, or share your favorite stories, and can even comment on those shared by others. Know this lady a long time. She was as awesome as her mother was. My thoughts and prayers are with Paul and his family.